Kanye West lost his mother Donda West almost eight years ago. In video uncovered this week, it shows how close the late English professor and her only son were prior to her 2008 death has been revealed. Donda has been the source of inspiration for many of the 37-year-old's songs but none more so than Hey Mama. It is this song that has now become a tribute to Donda, but in the early 2000s it was her favourite and in the video which has resurfaced online, the pair touchingly performs the track together. 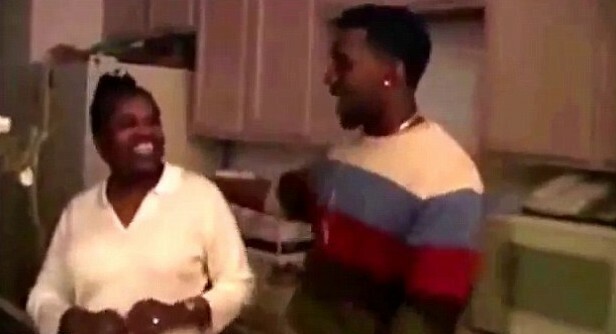 Filmed some time before the 2005 release of Kanye's sophomore album Late Registration - on which the track appears - the home movie shows the pair's very close relationship. The video starts out with Donda talking about one of her favourite lyrics and encouraging Kanye to rap it. Trying the verse herself frost, the Only One rapper then takes over much to her joy. However, he struggles at times to remember the words so when Donda senses this is the case and she chimes in to remind him. While fans got to see a snippet of this way back in 2008 as a part of an MTV special, it is nevertheless heartbreaking. It is the second part of the grainy home video that really pulls at the heart strings. The second half was until this week completely unseen and shows the pair performing Hey Mama in their kitchen. 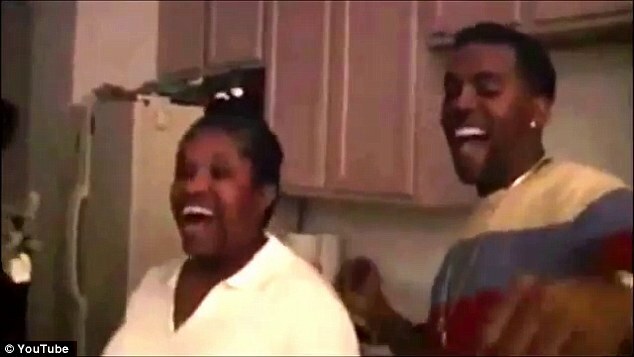 While Kanye is known for his bad moods and never smiling, clearly around his mom he was a different person. The husband of Kim Kardashian smiles, laughs and dances around as his mother sings the chorus while he raps over the top. As the pair does their duet, a then Twenty-something Kanye cannot help but keep looking at his mom and muse. Kanye has often spoken of the impact his mother's death has had on him, both in words and in song, and has revealed he even considered suicide after her passing. Donda died in 2007 after suffering complications following cosmetic surgery. Kanye's mom was just 58 when she underwent a breast reduction surgery and liposuction, however, unbeknownst to her and her surgeon she was suffering from coronary artery disease and she suffered a heart attack the following day. The rapper said last year his biggest regret was that his mom never got to met his daughter North West, whom he shares with Kim. He told fans at a concert: 'These past 10 years have been amazing. 'There's been some ups and downs. I made some mistakes and I've made some accomplishments. There's only one thing I regret. In honour of that, in his song he co-penned with Paul McCartney, Only One, the rapper sings to baby North as his own mother, saying that she tells him even in death to make sure the child knows about her.